This event took place in Sandton this weekend. Everything that’s wrong with the world was bundled neatly into this conference. It was an exercise in marathon infomercial brainwashing with a cult-like approach that turned people into stampeding zombies that sickened me to my stomach. The only names I knew on the lineup were Robert and Kim Kiyosaki. The schedule was 9am to 8pm both days and on requesting an agenda were told : “we don’t hand out that type of information”. Rather an unusual attitude for a conference wouldn’t you say? The sales pitch on the website about the content of the event. As a business owner and entrepreneur wanting to take things to the next level, I was attracted to that. I thought we’d be getting invaluable insights into running a business and how to improve it. That did not happen, not even close. The agenda is not supplied so that you can’t figure out the strategy they employ to seduce you. They have a “big” name in the speaker lineup to entice you to buy a ticket, (Robert Kiyosaki, Donald Trump). First in the day is an MC that tries to get you pumped with vibey music, and getting you to stand up and shout “yes” and chant, jump up and down, turn to your neighbour and affirm how cool this all is and hug and all that. He shouts “money, money, money” over and over to make you want it, make you think that it’s the only thing that matters! Then a motivational speaker comes on that appeals to your heart strings and makes you laugh and feel warm and fuzzy. Now you’re pumped, ready to learn, ready to take it to do anything. The self-appointed ‘big boys’ start coming on telling you how much money they made in their industries “I bought 40 properties in a year, don’t you want to do that??”. They seduce you with how easy it is to make so much money; then say that you too can make this kind of money – but only if you buy their products. 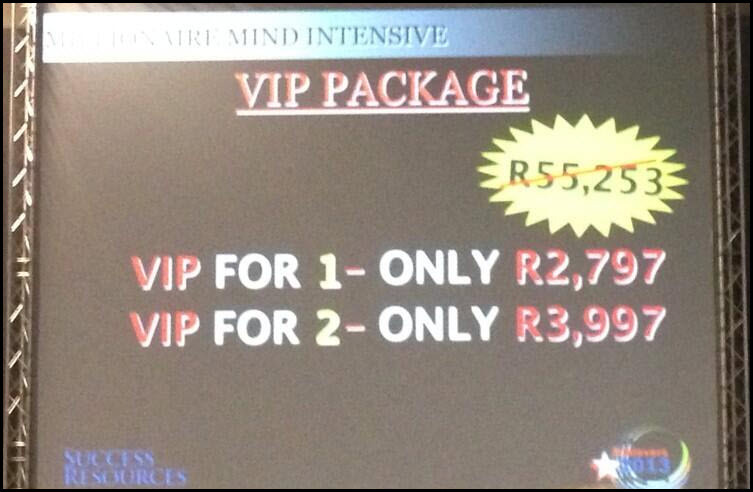 And those products ranged between R20000 and R70000 for 3 days, courses, one-on-one’s, CD’s, etc. This went on and on and on; speaker after speaker. The sickening part was watching thousands of people fall for this scam. Watching them storm the stage to take advantage of a perceived “limited offer special” was truly heartbreaking. People ran to get on stage and queued all the way down the isles to be next. None of them even came close to seeing how they were being conned. My heart bled for humanity. We paid just on R1000 for the cheap seats to that event. Other seats where just under R3000 and the front row seats over R5000. There were 4500 people at this event. At a very conservative average of R1000 a ticket, they made R4.5million in ticket sales alone for 2 days – all money that is leaving this country. The entire 2 days was a hard sell, psychological pitch to make you part with tens of thousands of Rands more and get money out of this country. There were at least a 100 school kids in that audience, it nauseated me to know these impressionable young minds were being exposed to a pure scam like this. This is not what our future leaders should be learning. All that event taught them was how to lie, manipulate and take advantage of people and think that you can achieve untold riches by doing nothing more than attending a 3 day course. They spent a lot of time encouraging you to take your money out of this country and convincing you that South Africa is not the place to invest. I have a major ethical problem with this! We need to be empowering ourselves and investing in our own country and its people. We have unbelievable talent and potential in this country. They said South Africa is not the right place to make money off property, (“not even in Cape Town”) and that we must only buy in the UK. I think Mark Corbett, CEO of the Century Property Developments in South Africa would have something to say about that. His 11 year old company did a Billion Rand in sales last year and they are building the biggest development in South Africa; a R45billion eco development in Midrand / Kyalami called Waterfall City. Attend one of his free seminars if you want true, practical business advice. The event is designed to prey on human insecurities and herd you into buying thousands of Rands of products that I am willing to bet 90% of that audience can ill afford to do. They invent astronomical prices and then give them to us at a “discount”. This was a cheap package, but some of them were truly outrageous. From R55253 down to R2797, really? Do you not see what they’re doing? They had a 3 day speaking course for R70 000 which they say will teach you to become a keynote speaker and make you earn R25 000 for getting on stage. Utter BS! As someone who’s spoken at conferences around the world, I am telling you that that is never going to happen after 3 days of some random course! R70 000 is a year’s worth of university fees! Do not be fooled into this slick sales talk! It is highly unethical and misleading! For anyone that got suckered into buying this weekend, just remember that our National Consumer Protection Act allows you a 7 day cooling off period. Cancel those purchases and find local talent that can help you achieve your goals. These people are taking all your money overseas and not empowering this country in any way! We have the most incredible talent in South Africa and this congress spent 2 days convincing you that we don’t. Do not fall for it. Not only that, but 90% of what they were selling you can get for free online, do you research and ask the right questions. Don’t send your hard earned money overseas with people that do not care if you live or die. Local is lekker! 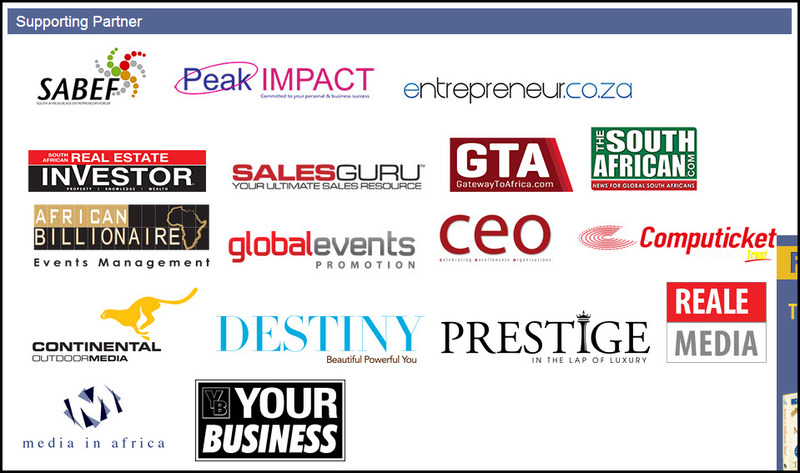 These were the companies supporting the event. Honestly, I will not do business with any of these companies if this is the ethics level they align with. There are people out there that will prey on your every weakness. Use the words “make lots of money”, couple it with scarcity and people will stampede to get you, literally. Use enough smoke and mirrors and people will fall for anything. It is more important than ever to help people find themselves and heal their rift with their souls so that they can find real peace and not this false sense of security. People are utterly desperate to make money and get ahead, but they are not asking the right questions. Research events properly before attending them. Don’t be fooled by ‘big names’ on the ticket – get proper detail about the content. If no agenda is supplied, it’s an immediate red flag that you’re going to be sold to. If you pay upwards of a R1000 a ticket and you still have to pay for any food or beverages at the conference, something is up and it’s not good. Beware the company you keep and who you align yourself with! While the first speaker appeared to be empowering, after understanding the scam strategy employed to entice people to this event, I question if what anything they said was genuine or if it was all just designed to soften you up for the hard sell. Good cop, bad cop. Being rich is NOT going to make you happy. You need to be happy inside yourself first, no matter where you are, who you are with, or what you do. If you are not happy, content and at peace in your heart, you will fall for every con artist, fly by night, get rich quick scheme like the National Achievers Congress out there. Having a successful, wealthy company is going to take years of very hard work. There are no shortcuts, nor should there be! I am not alone in my thinking, Anil Salick, Erik Kruger and Simon Brown from Finweek thought so too, as well as a few other awakened individuals on Twitter. We have a responsibility to those who cannot help themselves to expose actions like this event for the scams that they are. Light workers please stand up and speak. You are needed. Very well said . Thank you. I’m from Singapore where the organizer company success resources was founded. I have yet to hear any sucess stories from my friends who spent a few to more than 10s of thousand Singapore dollars on NAC courses in the past. The relevance of the speaker and standards of the talk has been dropping. In Singapore, we now even have a Chinese version where some background of the speakers are fishy. As I have attended the event for a few years in the past and stopped going this 2 year, there just seemed to be a more and more aggressive effort from telemarkers to pass me complementary tickets to attend the events. The marketing effort to draw crowds is getting more and more desperate to ensure the speakers have enough audiences to sell out their products. Ick. I wish I saw this before attending a “Tony Robbins” event this past week. I was floored at how much time was spent marketing to me from people (all men!) who were not on the schedule. Bottom line was I picked up enough that it was worth the $100 and a day of my time but what I learned was from 3 hours of the 12 hour event. I could have used those other 9 hours to actually work if I had known it was going to be so bloated. It’s incredibly sad…. I attended another similar event last week, blogged it – was immediately sent a lawyers letter threatening me with all kinds of things if I did not remove the post. Thank you for writing this! I had the same experience at a National Achievers Congress in the United States. It is set up to psychologically and emotionally manipulate people, and it preys on people who can’t afford to be preyed on. I know, they’re an incredibly sneaky dishonest bunch. @Thozi, yes you are right. I also made the mistake of not doing my homework first, it won’t happen again for sure. @Deon, that’s good to hear. Someone called me about this blog yesterday to discuss what could be done about it. I’ll keep you posted if something comes from it. @Anton, and least we had some good Twitter company giggling about the craziness of it all. @Alex, thanks. I can’t handle gross injustices like this. We all have a responsibility to speak up when we are able. Thanks Veronique,,,, I think it’s ignorance and laziness that will always get us in a deep mess,,,,did not attend d conference but have listened to the free online videos of all d 3 speakers and know their material. people should do their homework before they jump into des things cos I don’t understand why must one pay dat amount when Les Brown for example have free online videos abut d same topic.. Brilliant article, Veronique! Call it like it is. It seems South Africans are not yet used to the hard-core NLP and crowd-psychology techniques employed by some of these “experts”. 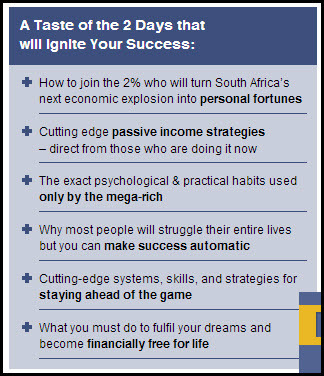 I would be happy to participate in anything to educate South Africans about the dangers of these get-rich-quick schemes. Thanks Veronique for the blog post. I think the whole conference was lame and I’m mad that I wasted two days on attending it. Only good thing about the conference was the burger I ate at Riffs next to the convention centre. I had my suspicions of what the conference would be like after receiving a number of invites. Well done for exposing it. It is crazy how people fall for these scams…happens everywhere. Cheers for exposing it in Twitter and in your blog, in this structured way. It is good to think that it might help someone realizing that their “success” is selling the conference tickets, all the rest are lies. Hi, Veronique – Welcome to the American Dream 🙂 🙂 I will now hop around the office shouting “Money, Money, Money!! !”.